Get two gadgets in one plan package from Sun Cellular when apply to their Postpaid Plan 600. Starmobile Engage 7+ and Starmobile Navi Android phone can be yours with a monthly charge of 600 pesos. Be wise on spending your hard earned money, why not try this affordable Sun deals. Not just gadgets, you’ll also enjoy the bundled cellular services on this plan. You can get unlimited call, texts and even free surfing hours every month. Text to all networks also is not a problem to connect and update your contacts as it includes 350 texts free to other networks. Enjoy thousands of games that you can install on your tablet and enjoy your new Android smartphone all in one bundle, only from the network that offers affordable postpaid pricing. 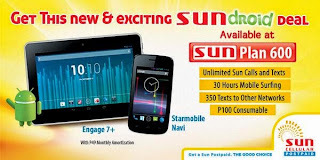 Check out other Starmobile gadgets under Sun Cellular Plan.